Learning professionals will enjoy discovering how simple and easy it is to incorporate mobile devices into their training delivery, as well as specific ways they can use mobile learning to help their team acquire and retain information faster and in a more engaging way. 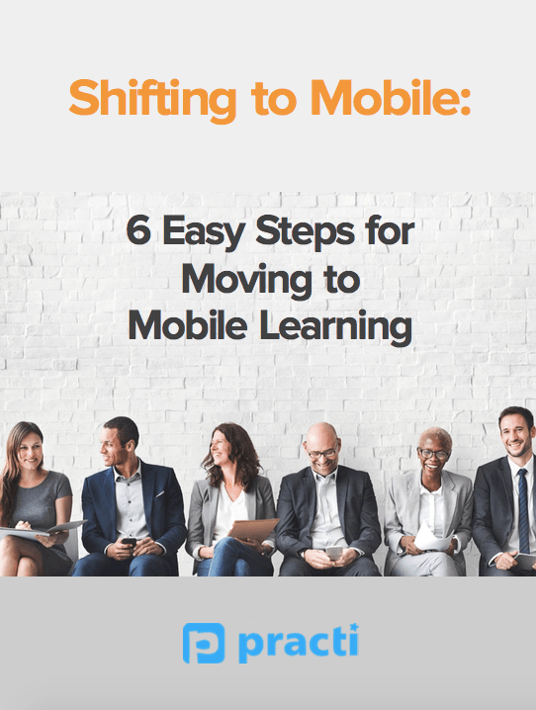 This free eBook will help you discover six easy steps that you as a learning professional can take to start delivering independent learning to your team and save precious time and money when you move from classroom to mobile, lecture-free learning. Are you eager to make use of the benefits of mobile for learning but not certain how to start? This chapter will outline the top tips for how to tackle those tough first decisions so that you and your team can make the best plans and preparations for a successful first mobile training project. If you are curious about whether your first mobile learning project can benefit from change management, this chapter will give you the definitive answer. Learn how to align mobile learning projects with existing CM strategies and how to use change management to ensure your mobile learning project is a success. Great mobile learning starts with great content. This chapter will help you identify content that suits bite-sized, just in time, self directed learning and how to convert it into engaging mobile delivery. Find out how mobile delivers quick wins for learners with more than just a transfer of knowledge. Learn how to create or repurpose your training content to make it highly suitable for rapid mobile delivery. This chapter will show you how to chunk your content, simplify text, add supportive images, choose when to use video or audio, and how to pace your learning to suit mobile. In this chapter, we explore the six required elements of a successful mobile learning game, starting with an easy plan to execute and tips for including your team on decisions about game dynamics. With Practi mobile learning, course authors are able to view real time, data driven learning analytics and reporting that take them beyond the traditional LMS systems and help them connect training performance to essential business results. 70% of today’s workforce learners feel more motivated when training on a mobile device and, while on their mobile devices, learners complete course material 45% faster. Those are solid reasons to start making the move to training on mobile! Practi has crafted the ultimate mobile learning guide! Find out about the value mobile learning brings to the table, best practices, as well as what makes mLearning so effective. Whether you are new to the world of mobile learning or an expert already, this eBook addresses all levels of expertize.